Located next to the Botanical Gardens, the National Museum (now officially called the National Museum and House of Culture) was opened in 1940 in the King George V Memorial Museum. A new wing was built in 1963 and King George V's car can be viewed here. Visitors can see archaeological finds such as rock paintings and a 3.6-million-year-old hominid footprint. 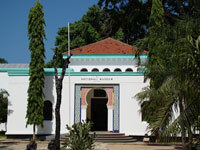 The museum presents an overview of Tanzania's history, including displays on the Kilwa period (9th - 15th century), the English and German colonial occupation, the slave trade, local rebellions, and the struggle for independence. Although by no means a state of the art museum, this simple institution has some fascinating artefacts and is a good one-stop attraction for those wanting to come to grips with the history of the country.